Orange peel sweet pachadi is our latest invention with orange skin. Last week I bought a kg of Orange( Kamala orange in South India) as Raksha loves its juice very much. Every time I discard its skin as I was not aware of its benefits. Recently I found orange peel has so many health benefits. So I told my MIL to try some recipes with orange peel. She prepared 4 different recipes with orange peel. I have shared a picture of them in my instagram page as well. 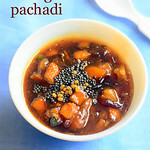 Some of my readers wanted the recipe for orange sweet pachadi. So I thought of sharing this as my first post with orange peel. I will try to share the remaining recipes in upcoming weekends. My MIL prepared this orange sweet pachadi following our mango sweet pachadi. But coconut is not used in this recipe. Instead we used ground black dates paste to give thickness and binding. So you can also call this as orange peel dates pachadi.We used jaggery instead of sugar. It tasted yummy with the sweetness of dates, jaggery to make it healthy. Tanginess & mild bitterness of orange skin with spicy taste of green chillies. So this pachadi is a blend of all the 5 taste. I relished this pachadi with sambar rice and curd rice. I loved it. I am sure you will like it too. Ok, lets see how to make orange skin sweet pachadi with step by step pictures. Do check out my super soft eggless orange cake without condensed milk. 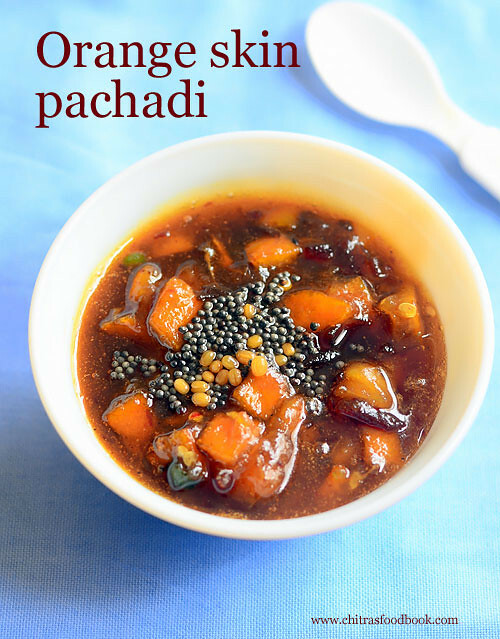 How to make orange peel sweet pachadi with dates and jaggery ! Wash and chop the orange skin into small cubes. Pressure cook by keeping in a box in high flame for 2-3 whistles adding little water. Discard the water and set aside. Boil jaggery, green chilli, salt, water till jaggery melts.Add cooked orange skin. Grind dates to paste. Add to the pachadi.Boil till thick. Temper mustard seeds, urad dal in oil. Add to pachadi and mix well. Store in a box after it cools down. It stays good for a week in refrigerator. Remove the white threads from orange skin to reduce the bitterness and chop it into small cubes. In a pressure cooker base add 1 cup of water, keep the orange cubes in a small tiffin box, add little water and cook in high flame for 2 to 3 whistles. You can also steam in an idli pot. Discard the excess cooked water. Keep the orange cubes aside. In a kadai, take grated jaggery, finely chopped green chillies, a pinch of salt and 1/4 cup of water.After the jaggery is melted, add cooked orange pieces. Mix well. Do not cook orange pieces for long time. It will become hard to chew. Crush black dates to a paste using mortar & pestle. Add this paste to the orange mixture. Add 1/4 cup of water. Mix well and boil till raw smell of jaggery and dates goes off. If the pachadi is too thick, you can add some water. Adjust the consistency like jam. Remove from the kadai. Orange pieces tastes slightly chewy on the first day but it becomes soft the next day. Heat oil in a kadai and when it gets heated , splutter mustard seeds, urad dal and add to the pachadi.Mix well and let it cool down. Store in an air tight box and refrigerate. It stays good for 1 week to 10 days. This pachadi thickens over time. So you can adjust its consistency by adding some water and boil it. Relish it with bread, curd rice or sambar rice. I can lick it as such ; –)). Enjoy ! Cooking orange pieces before adding to pachadi is mandatory. If you saute and cook in jaggery, it will becomes chewy and hard. So do not attempt to cook directly in pachadi. Adjust the quantity of jaggery as per the bitterness of orange skin. Dates is used for binding. You can also use tomato puree instead. Add more green chillies if you want to make sweet and spicy pachadi. 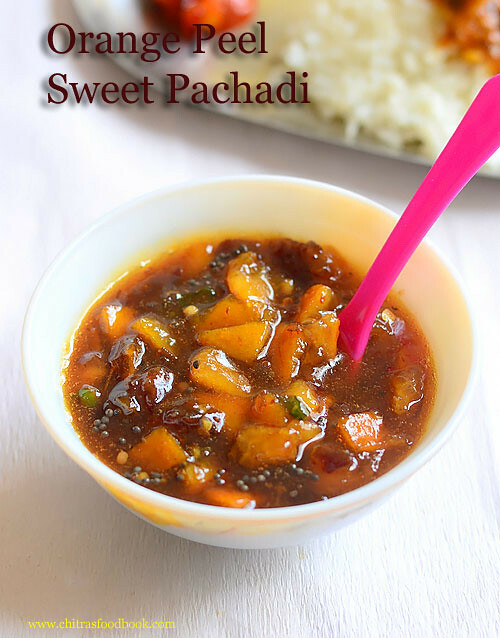 Try this easy, yummy orange skin sweet pachadi and enjoy ! 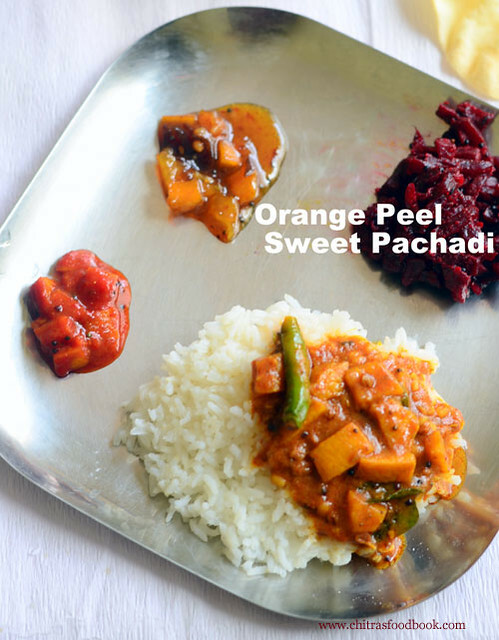 In the below image, you can find orange pickle, orange skin kuzhambu and sweet pachadi.